WARNING: This is a preview of Gnomi. All components and rules are prototype and subject to change. Lace up the boots, put on your pointy hat, and grab a shovel it is mushroom farming time! 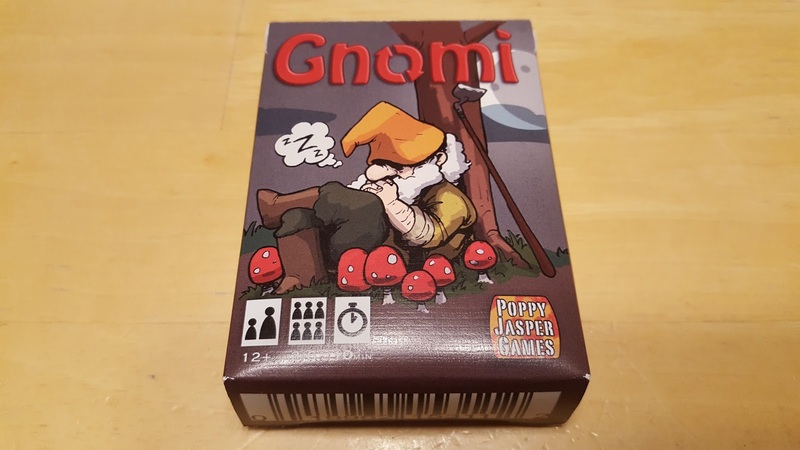 In Gnomi you are trying to protect your mushrooms from your gnome counterparts while trying to steal or compost theirs. The gnome that does this best will be king of the shrooms! Play a mushroom. When playing a mushroom he announces the color of that mushroom and picks a player who must give him a mushroom of the same color if they have one. The mushroom he just played is then composted (turned 180 degrees so the trash can is up) and the other mushroom is placed mushroom side up in his hand. Play two mushrooms. To do this he reveals two mushrooms in his hand and takes a mushroom from one other player. The two mushrooms played are then composted while the mushroom taken is placed in his hand mushroom side up. Play a gnome. Gnomes have a wide variety of special powers from sprouting composted mushrooms to composting other player's mushrooms. 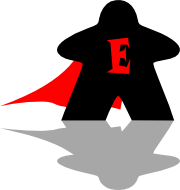 Once played a gnome is returned to the his hand and is put to sleep (rotating 180 degrees so the sleep icon is up). Pass. The final action he can take is passing. To do this he must compost a mushroom or put a gnome to sleep. 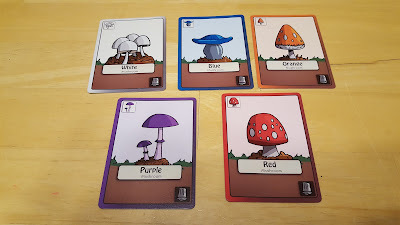 The game ends when all but one player has all their mushrooms composted and gnomes sleeping. The player with at least one mushroom or gnome right-side up wins!!! Whats in the box? Cards! 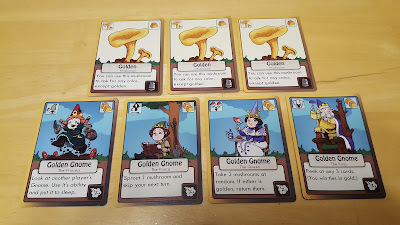 The copy of Gnomi I received also came with the Golden Expansion which introduces three Golden Mushrooms and four new gnomes. With the expansion players will play three games in total with the winner of each game taking a random golden gnome worth a certain amount of gold. These gnomes are kept from game to game as part of a player's hand and can be used like a regular gnome. Player's also receive Golden Mushrooms which again are used as regular mushrooms and can be stolen by other players. When the third game ends players count up the amount of gold they have in their hand and the player with the most gold wins! Now that you know how to play Gnomi let's see what I thought about it. The rules that came with my copy of Gnomi were short and sweet, only taking up a small single sheet of paper (front and back). 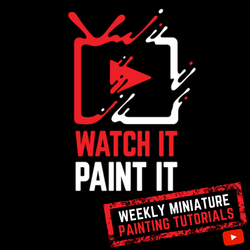 The game is very simple to pick up and easy to teach other players. 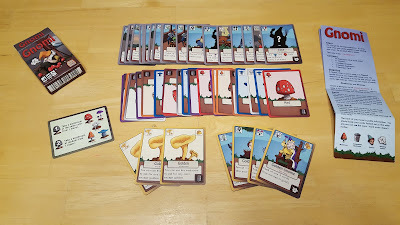 Set up is a breeze as you are only dealing each player four mushroom cards and three gnome cards. All done! 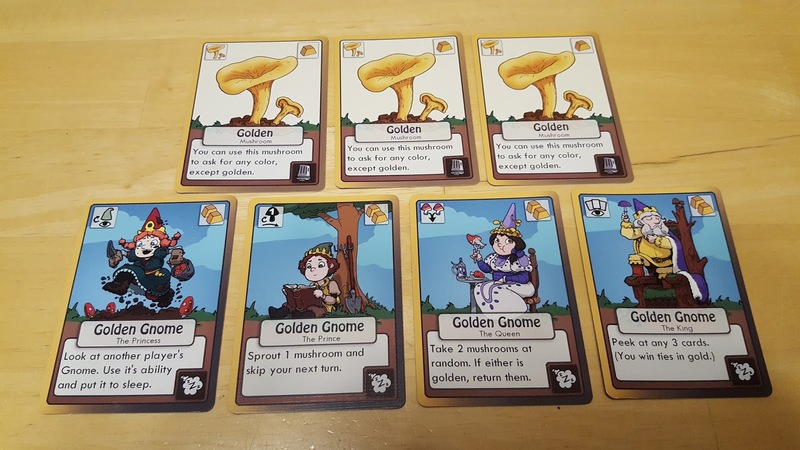 I love the theme of gnome mushroom farmering and it works really well with the mechanics of the game. 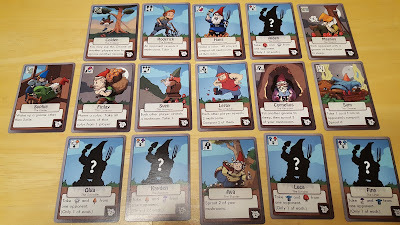 Sure you could do this game with a different theme, but gnomes are awesome! 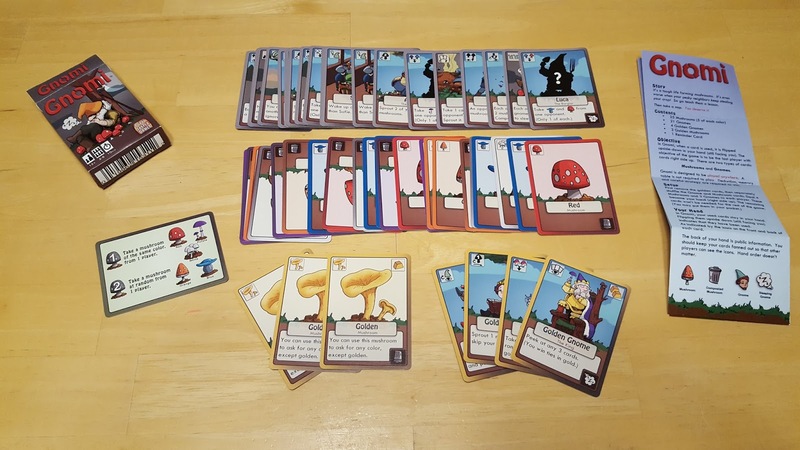 Gnomi is a cool hand management deduction game where you are trying to keep your mushrooms from being stolen and composted while trying to figure out what your opponents have in order to compost and steal their cards. I dig how this works and love the rotation of the cards keeping everything in your hand and in essence not needing a table to play on. 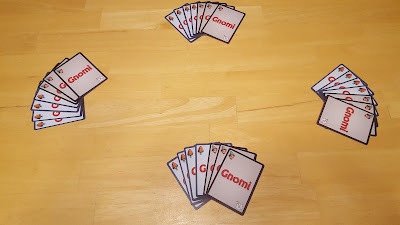 Gnomi plays fast, normally around 10 minutes, with three to four players and is pretty seamless. As I mentioned above it is easy to learn and teach, in fact the 12+ age range is a bit high in my estimation. I had both my 7 and 9 year-old playing with no problems. I would probably make that 8+ and feel comfortable. I absolutely love the artwork for Gnomi, which was done by the same artists as Lost Woods which I also love. 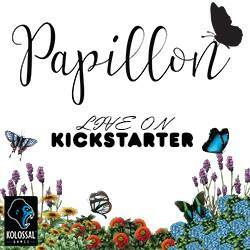 The illustrations are whimsical and polished while the card layouts are very functional and easy to interpret. I am not sure how the final version will be made but the card quality on the prototype was very good. Artwork is number one, it drew me in immediately. The game play is solid and fun. I really enjoyed the back and forth between players and the suspense as the end drew near and you were trying to figure out how to eliminate your opponents before you were eliminated. Not sure there is anything bad here. It might be a bit light for some gamers, but not all games are for all gamers. This is a delightful quick filler game that should make it into your collection. It will be in mine! 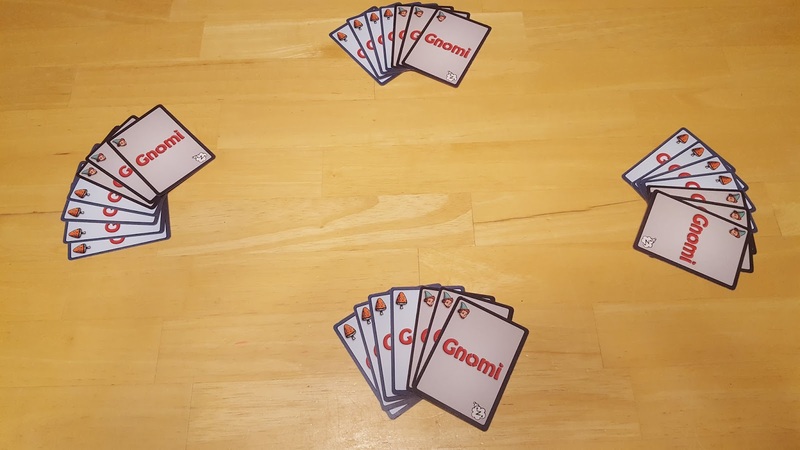 Quick light card games that can be played anywhere like Oddball Äeronauts, Love Letter, and Fluxx will love Gnomi!!! I am giving Gnomi 8 out of 10 super meeples.